To be honest, I would have never known about Curry Away in Edgewood if it weren't for a LivingSocial deal that arrived in my inbox one day back in July. The amusing name caught my attention immediately, and because both R. and I love Thai food, I figured I'd get the deal so we could go check out this place some time. This little unassuming joint is located a bit off the beaten path in a little strip mall that's easy to miss. (Thank goodness for Garmin!) 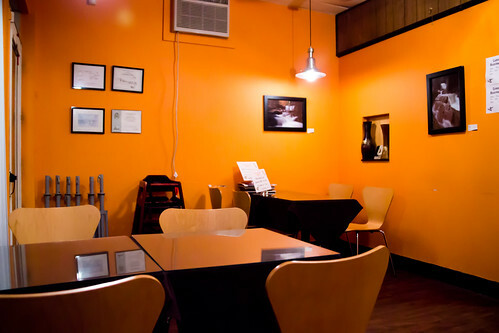 The inside of the restaurant is tiny with only 14 seats total. 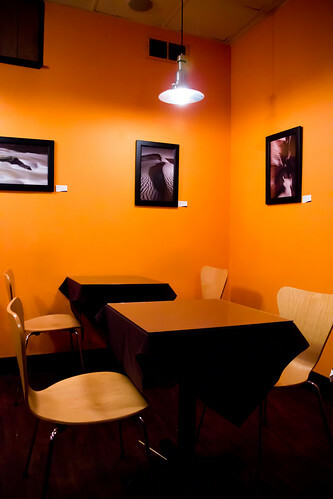 The walls are decorated with photography that customers can purchase. We went on a Sunday night, so the restaurant wasn't busy aside from some take-out customers. They seem a bit short-staffed nonetheless, as our server, who is from northern Thailand, seemed to be needed in the kitchen quite a bit. He was nice, in any case. 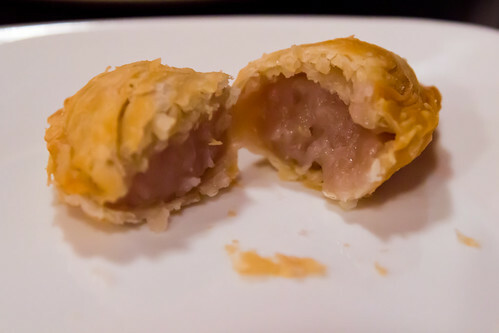 For our meal, we started with the appetizer special, the Curry Puffs, with a choice of either chicken or taro filling. 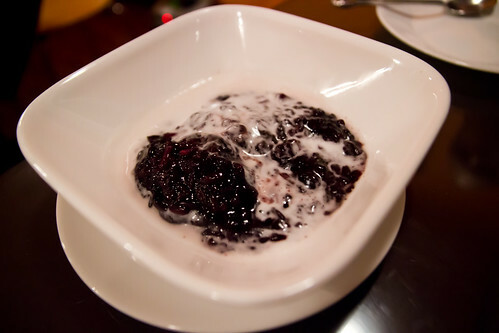 Being a huge fan of taro, we naturally picked taro as our option. I liked these - the mashed taro filling is sweet but not overly so. 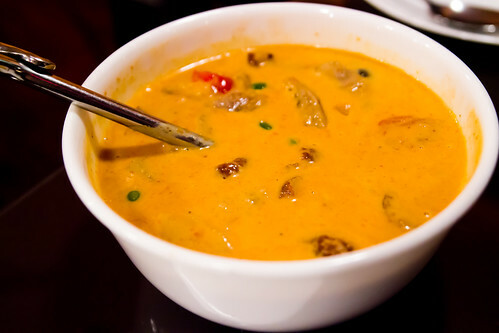 As for the main course, it is pretty much a rule that I must order curry when I'm at a Thai restaurant. I can't help it. I am a curry fiend. I can seriously eat curry every day and not be sick of it. 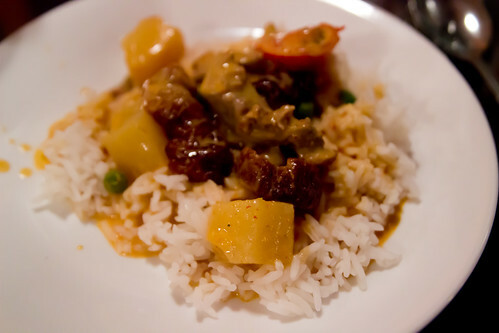 Of the ten or so curry options, I decided on the Duck Curry, described as roasted duck, tomatoes, pineapple, peas, carrots, and coconut milk. It was tasty, and there was so much that I got an extra two meals out of it. Luckily, R. did not order curry, so at least I get to share a photo of something other than curry. 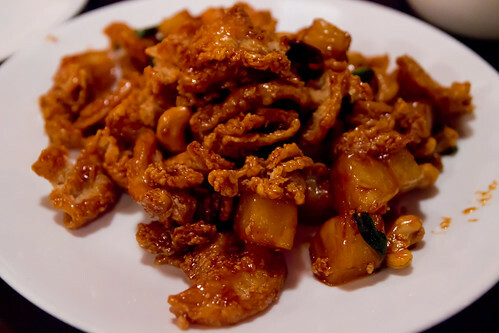 :) R.'s entree was the Chicken Cashew Nut, with crispy chicken sauteed with chili, pineapple chunks, scallions, and cashew nuts, in a homemade sweet and sour sauce. I had a bite of it and can attest to its deliciousness! We both enjoyed Curry Away a lot. 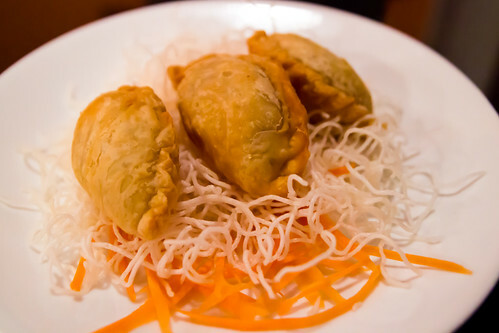 It's a nice, casual neighborhood joint that serves great Thai food at great prices. They offer weekday lunch specials for under $7 and free delivery as well. I highly recommend it!